​ Ready to get started now? Click here! Essential oils came to me in a way I would have never expected... bugs! Yes, you heard it right... BUGS! Let me explain. I love the outdoors... love hiking with my dog, gardening, and playing outside. I spend so much time outdoors, I've even created an outdoor office work-space where I can conduct work from the patio next to the flowers in my garden. With this comes bugs... and bug bites! There is nothing more distracting to work than bugs interrupting your work flow. Seriously. Mosquitos, flies, and who knows what type of bugs. I'm talking bugs I've never seen before - biting me, and causing giant welts on my skin... and ITCHING galore! If I was going to make any progress, the bugs HAD to stop! I searched for the best types of insect repellents. Of course the first search results that come up on the internet are bug repellants loaded with chemicals. Boo! Well, I don't use products that contain harmful chemicals, particularly DEET (its a very, VERY bad neurotoxin). So I began researching natural ways to deter bugs... and VOILA! I discovered essential oils not only to be effective at keeping the bugs away, but provided a great scent, one I felt comfortable applying to my body. I created, tested and developed the formulation of Bug-A-boo! Organic Insect Repellant. I compared Bug-A-boo! to similar products from health food stores, amazon, and other products recommended to me. I smelled and tested over 25 varieties. None, I mean NONE compared. Not even remotely in the areas of effectiveness, healing, scent and Bug-A-Boo's cool-airy feeling when applied. After using Bug-A-boo! for the past couple of years I've noticed it not only keeps the bugs away and smells delicious, but it also HEALS bug bites, cuts, scrapes, and sunburns... and it delivers a cool feeling when applied. When I say heals, I mean HEALS - insect bites immediately stop itching, swelling is reduced, and within a couple hours cuts and bites are completely unnoticeable. Did I mention that the ingredients in Bug-A-boo! Organic Insect Repellant are so naturally organic you could even eat it? Yep... it's true - but I don't necessarily recommend eating it. Anyway, I digress. Back to EO's. ​So what are essential oils anyway? Essential oils have become a bit of a “buzz” word that a lot of people talk about. Essential oils are simply the oil that lives inside of plants. They contain all the goodness that protects and maintains the plant, and we can use them to help support our own bodies’ health and wellness. Are naturally aromatic and healing compounds found in the seeds, bark, stems, roots, flowers and other parts of plants. Are the essence of the plant. Provide plants with protection against predators and disease, and play a role in plant pollination. Are phyto-chemicals made up of volatile aromatic compounds. Lavender requires 175-250 pounds to produce one pound of oil. Rose oil requires 5,000 pounds of petals for one pound of oil. Melissa requires THREE TONS of plants to produce 1 lb. of oil - which sells for $9,000 to $15,000! ​Just as there is a vast variety of plants, there are as many different kinds of essential oils - all with different properties, uses and benefits. While absolutely AWESOME, essential oils are really nothing new. They have been used throughout history in many cultures for their health-supporting benefits. The Egyptians, Greeks, Romans, Europeans, and Chinese have used them for CENTURIES in health, beauty, fragrance, and spiritual practices. There are also many references to essential oils in historical texts, which signifies their importance in history. ​the health and wellbeing of you and your family? For me, I'm always looking for ways to enhance my brain function and concentration. And oils like Peppermint and Frankincense get my brain firing on all cylinders! There are a few other EO blends that are also great at supporting brain function... more on this later. Most commercial body care and cleaning products are filled with harmful, synthetic ingredients. I take great precaution with what I allow to be introduced into my personal space and environment. I began using essential oils in simple recipes and mixed my own body lotions, pain ointments, face creams and serums. They're so easy and fun! I seriously love them, and my skin and nails look great as an unexpected result. Then I realized, I still had a couple pungent toxic cleaners lingering in my cabinets. I’m really into having a non-toxic home... so to totally purify my home, I started mixing homemade recipes for cleaning and discovered that my new essential oil cleaning formulations not only worked better at CLEANING my home, but made the house smell great (and without toxic scented candles, air fresheners, dryer sheets, etc..). They were definitely better for my health than commercial brands. Lemon EO and Thieves blend are some of my go-to oils to create household cleaning formulations. I use diffusers all over the house and at my chiropractic office! I love it, patients love it, and so does Rio (my doggi). Orange and grapefruit quickly change the atmosphere of the kitchen. Lavender helps me get a great nights' sleep. When I feel fatigued or blue, Frankincense and Cypress has quickly become my go-to diffuser blend. Those are just a few examples, but essential oils have also replaced many everyday products that I used to spend a fortune on. Vitamins, lotions, face cleaners, etc. etc. etc. For example, I now clean my home with oil-infused natural cleaners rather than toxic chemicals from the supermarket, and save a bunch of money, too. I cleanse my face with oil-infused natural products. And after an intense workout, after playing soccer or ice hockey, I benefits from rubbing calming and healing essential oils over my sore muscles! Let's face it, any athlete (warrior and professional alike) can certainly benefit from recovering faster... and essential oils offer natural properties to help the body recover and heal. Get started now with your 11 oils and diffuser here! ​Introducing Young Living Essential Oils! One of the most important things I’ve learned in my journey to healthy living is that it’s not just what something is – it’s where it comes from, how it’s grown, and how it’s processed, and where I KNOW the FARMER. Whether we're talking apples and oranges fresh from the farm, or cows grazing green pasture, or soft organic cotton t-shirts, I know that the source MATTERS. To ensure the purity of their oils, Young Living sets the bar high. Super high. They actually own their own farms and distilleries around the globe and follow a stringent process they call Seed to Seal – the HIGHEST standards for planting, harvesting, and distilling on the farms they own and co-op! If I’m going to use them around the home, put products on my skin, and ingest them... I want to know they are the BEST. I have spent valuable time getting to know my essential oils farmer, and his name is Gary Young! To be perfectly clear – there are no other oils on the planet that are comparable! As a Young Living member, you automatically become part of a big loving oily-family that will give you all the support and advice you need! It’s a wonderful feeling to know you have the help and reassurance of a generous and caring community of moms, experts, and lifelong users. I have made some of my best friends through my life with Young Living. We are one giant happy family! Want to be a part of this community? Click here to get started! No other essential oils company offers such a great-value and comprehensive range of products to get you started. The Young Living Premium Starter Kit contains your everyday staples – all the oils and equipment you’ll want to have on hand for a variety of situations. There’s an excellent user guide, too, that will help you understand how to use everything contained in the kit. Here’s what else is great: once you buy the YL Premium Starter Kit, you automatically become a “wholesale member” of Young Living. This means you may continue to buy other Young Living products for a huge 24% discount off the retail price! You’re under zero obligation to buy anything else as a wholesale member, yet if you do - you'll get 24% off! This is Young Living from Young Living on Vimeo. Young Living’s commitment to quality starts with seeds. The seeds they use are selected for the seeds ability to become botanicals with high levels of bioactive compounds. YL grows the seeds using cultivation practices that are dedicated to responsible and sustainable growing and harvesting methods. Next, YL distills using a gentle, proprietary technique for steam extracting essential oils and preserving their precious constituents. To guarantee consistent, verifiable quality, YL oils are tested in their own internal labs, as well as in third-party facilities. Finally, each essential oil is carefully bottled and labeled using state-of-the-art equipment. Young Living believes that you and your family deserve products that are genuine, free of synthetic chemicals, and of unmatched purity. Seed to Seal® is both a promise to you and a reflection of YL's sense of global stewardship. To ensure that Young Living is able to control every step of their Seed to Seal process, they actually own a number of farms and partner or co-op with many others around the world. Gary Young, founder of YL, personally travels the globe to scout farms that offer ideal conditions for growing premium botanicals. This personal, direct involvement in the growing process is what allows YL to ensure that each product delivers the purity and efficacy members around the world expect. One of the best ways is with the Premium Starter Kit. In the kit, you receive some of our most popular essential oils; a diffuser; sample packets of NingXia Red; and shareable materials, including sample packets, a roller ball, and more. It’s everything you need to discover the products for yourself and get immersed in the Young Living lifestyle. Let’s check out some of the oils in the Starter Kit. Ten 5ml bottles of essential oils: Lavender, Peppermint, Lemon, Frankincense, Copaiba, PanAway, Thieves, Purification, DiGize, and R.C. Plus a bonus bottle of the popular Stress Away blend. Scroll down to the bottom of the page to see how I use these essential oils every day. A choice of 4 different Diffusers (with optional light, optional 30-second intervals, and auto-shut-off). Two sample packets each of Lavender, Peppermint, Peace & Calming, Lemon, and Thieves (for you to share with your friends). Oh, and remember... once you’ve purchased your kit, you automatically become a wholesale member – which entitles you to 24% off all future purchases from Young Living! There are NO monthly minimums or fees, and you'll also get reduced shipping rates! Click on the link below to sign up. 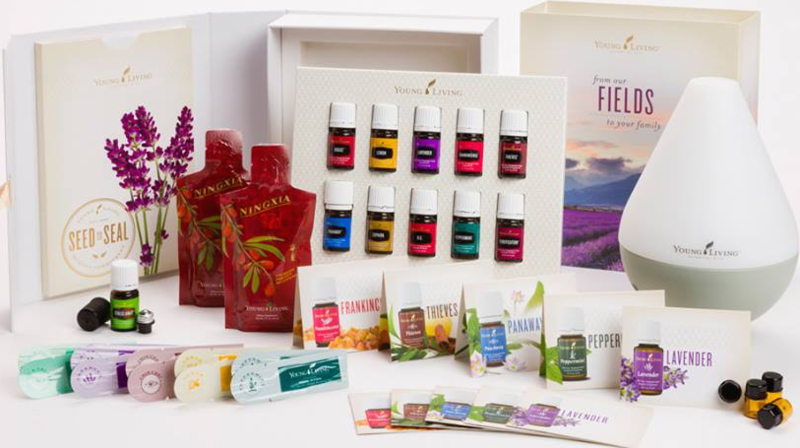 Select "Sign up as: Young Living Wholesale Member” – which will allow you to purchase the Premium Starter Kit. Select your order: the “Premium” or “Basic” Starter Kit. You also get to CHOOSE which diffuser you want from 4 options: the Dew Drop Diffuser, the Bamboo diffuser, the Rainstone diffuser, or the Aria diffuser. I highly recommend the Premium Starter Kit: it comes with everything you need to get started, and it’s the best value! Get even more for FREE! Ok here is an optional step but you can grab some amazing BONUS items if you go ahead and do it now on your enrolling order! Sign up for our frequent buyers’ club called Essential Rewards (ER) and you will EARN this month’s FREE promotional oils! In September you will earn another 5ml bottle of Lemon AND a 15ml bottle of Tangerine AND a 5ml bottle of our Aroma Life blend! That is THREE FREE additional bottles of essential oil! When you join, you’ll start accumulating rewards points for everything you buy, which can be used to get free products on future orders too! See the image below for full details on this month’s promotions because you can earn even MORE depending on how many items you need and purchase on this enrolling order! Hey, did you get your EO KIT & Diffuser yet?